We will leave Eugene at 9:00 am and make our way to the town of Depot Bay where you will be able to visit the Whale Watching Center and hopefully see humpback and/or grey whales spouting and breaching in the Pacific Ocean! You will have time to explore the quaint and beautiful downtown area and have lunch while here. After lunch we will drive south along the Pacific Coast Highway, and follow the Otter Crest Scenic Loop with a stop at Cape Foulweather. The rocky bluffs of this coastal stretch are dramatic along this winding three-mile section of the old Coast Highway, two miles south of Depoe Bay. 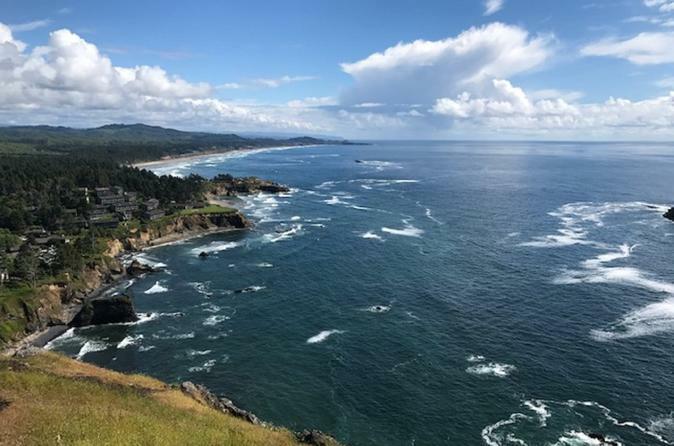 We will continue south to Yaquina Head Outstanding Natural Area. From exploring tide pools teeming with life to witnessing Oregon’s tallest lighthouse, there is something for every visitor at Yaquina Head. Next we will visit the Oregon Coast Aquarium. While here make sure to visit the largest population of sea otters in the state of Oregon, the Harbor Seals and Sea lions, the open-air/walk-through aviary, and the Aquarium’s Passages of the Deep exhibit which allows the visitor to literally immerse themselves in the ocean realm that exists right off the Oregon coast. A series of underwater walkways leads the visitor from the dark, quiet canyons of the Orford Reef, through the sparkling and teeming waters of Halibut Flats, and finally into the vast blue expanse of the Open Sea. These are just a few of the exhibits that the aquarium offers! We will end the day by checking in at our Newport hotel. You will have the rest of the evening free to walk on the beach, explore the historic Bayfront, or walk to the Nye Beach area and enjoy unique shopping, dining, and the arts. On the morning of day #2 we will have breakfast in our hotel and then stop at the Yaquina Bay Bridge so that you can take pictures of this Newport icon. The bridge stands 135 feet above sea level, and spans 3,260 feet between downtown Newport and the South Beach area. As we continue driving south there will be several stopping opportunities for pictures, short walks, beaches and dramatic geologic formations that may include (all weather permitting): Devils Churn, Cape Perpetua, Cook’s Chasm, Thor’s Well, and Bob Creek. Next we will visit the Historic Old Town district of Florence, an inland coastal village originally built on docks lining the Siuslaw river banks. Florence and the Siuslaw river are the Northern border of the Oregon Dunes National Recreation Area spanning 40 miles south along the Pacific with dunes as high as 500 feet. The Oregon Dunes are a unique area of windswept sand that is the result of millions of years of wind and rain erosion on the Oregon Coast. These are the largest expanse of coastal sand dunes in North America.